The mix of Art Nouveau architecture, Catalan culture, sparkling sea, and a thrumming nightlife make Barcelona one of Europe’s most irresistible cities. You could easily spend weeks and still not see everything the city has to offer. But, if you only have a single day, here’s how to make the most of the time you have. 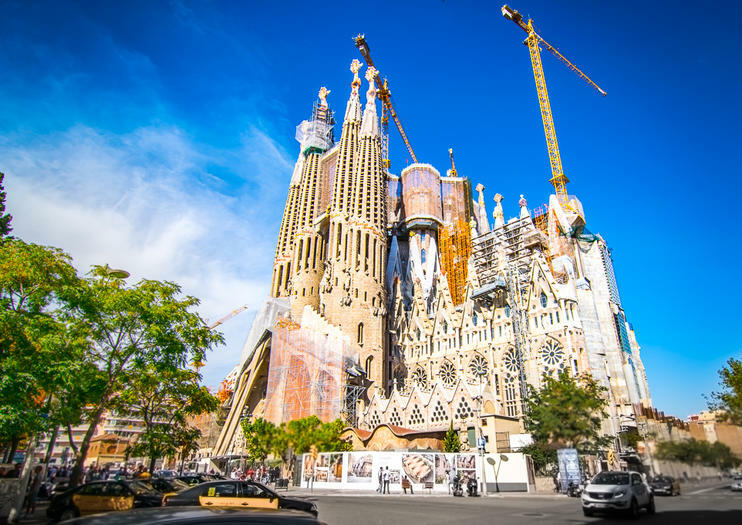 There’s one landmark you must see when in Barcelona: the Sagrada Familia. Save time with skip-the-line tickets booked ahead of your trip, get an early start, and take in views of the Catalan capital with a tour of the cathedral’s towers. Then, head to nearby Park Güell, another Gaudí masterpiece, for more city views and quirky, colorful tile work. It’s possible to pack in even more of the architect’s work with a Gaudí-themed tour that includes entrance to both Sagrada Familia and Park Güell, plus a walk down Passeig de Gracia to see Casa Batlló and La Pedrera from the outside. After lunch, head into the labyrinthine old city to soak up the atmosphere that keeps travelers coming back. If you want to be sure not to miss anything, opt for a walking, cycling, or Segway tour through the Gothic Quarter, El Born, and Raval neighborhoods. Another option that’ll help you see more in less time is to board a hop-on hop-off sightseeing bus. Grab an outdoor seat and tour the city with audio commentary about what you’re seeing. No trip to Barcelona would be complete without treating your taste buds to some Spanish cuisine. As a first-time visitor, it can be hard to tell the good stuff from the bad, so enlist a local’s help during an evening tapas tour through the old city to taste some of the best bites around La Rambla, La Boqueria market, and the Gothic Quarter. Those interested in the Spanish art of flamenco can grab a table at the legendary Tablao Cordobes for a paella dinner and an evening of dancing, singing, and Spanish guitar. Experience the culture and cuisine of Barcelona on a 3.5-hour electric bike, tapas, and wine tour. Follow your knowledgeable guide through the atmospheric streets of the Catalonia's capital in search of landmarks such as the El Born Cultural Centre and Frank Gehry’s Golden Fish sculpture. Absorb the botanical beauty of Parc de la Ciutadella, and admire the picturesque charm of La Barceloneta port. Appease an appetite for authenticity by visiting a local bar to feast on up to four tapas dishes and three drinks in a convivial atmosphere. Take private Barcelona tour with this easily-customized, half-day excursion led by an expert guide. Pick the time of day and Barcelona sights that you find most interesting, as your guide helps arrange a personalized experience based on your request. Move easily through the city via vehicle and by walking with your guide. During your visit you may stop by such iconic sites as Antoni Gaudí's Sagrada Familia cathedral, ancient Gothic quarter or the gorgeous hill-top attraction of Montjuic - it's up to you. This private tour of Barcelona also includes round-trip transportation from your hotel. Experience the architectural and artistic majesty of Barcelona on a half-day bike tour of the city. Energize and enjoy yourself on this exciting excursion with a knowledgeable and experienced guide; see all of the city’s significant sights such as the La Catedral and Placa del Rei as you gently cycle between magnificent monuments. Capture fabulous photographs at each stop and gain insight into the city’s fascinating history with informative commentary. A moderate level of fitness is not required on this tour due to the gentle nature of the route. Make the most of Barcelona for less with the great-value Barcelona Card. Choose a 72, 96 or 120- hour Barcelona city pass, and enjoy money-saving deals on a host of sights and activities. Gain free or discounted entry to more than 20 top visitor attractions, including the National Art Museum of Catalonia and Chocolate Museum; enjoy savings at other attractions; and get free travel on Barcelona transport services, including the metro and buses. Plus, get a free guidebook, city map and over 90 special offers at select shops, restaurants and outlets.